The Lonely planet India version has been around in various forms now for many many years with newer and updated versions coming out every couple of years. The latest version is amazingly the 13th edition and came out in September of 2009. Like it's predecessors it is an invaluable tool for anybody travelling to India especially newbies and India first timers. Unfortunately due to it's extreme usefulness it is possible to get hooked by it - so many times have I seen people buzzing around new places with their noses buried deep into a scruffy lonely planet. So this page is here as a warning: The Lonely planet India guide - Use with care! 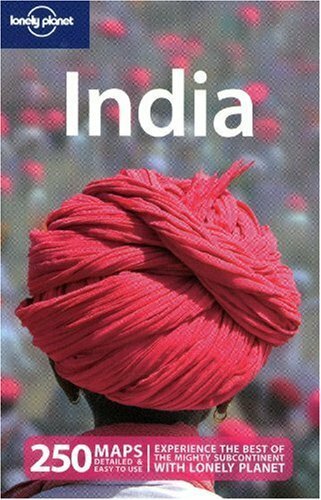 For the first timers it has everything you need to know about India and it's advice is invaluable. For those more experienced adventurers the book comes into it's own serving as inspirations for the next place to visit, or a great restaurant review. Probably - this book may have a bad reputation amongst travellers for taking the adventure away from such an adventurous place but it still remains the classic guide to India. I would say that it is vital piece of equipment especially for the India first timer. Plus, when you're bored of it you can always sell or swap it when you're out there! Amazon has a great selection of these book for sale and also loads of user generated reviews to help you make up your mind. Follow the links for further information. Do I need the latest version? In short - No. To be honest the newest version is nice but you get by just fine without it. Don't start going too far back into the archives because they do start to get seriously out of date - Anything this side of 2004 will serve you just fine! India is a big place and thus requires a big book. The Lonely planet India will probably be one of the bigger and heavier things you will take on your trip but don't let that put you off. When your back starts to strain simply sell it or trade it in for another book. This is common place between both bookshops and fellow travellers in India. Where is the best place to buy it? In my opinion Amazon.com have is the best place to buy this book simply because you have a massive range to choose from, used or new etc. This link will take you the India lonely planet page at Amazon.com where you can read more reviews, buy and generally find out more information about the book.